Is there a (standard) test to compare quantiles – some of them perhaps ? Can we compare easily quantiles when have two (or more) samples ? Note that this example on temperature could be related to other old posts (see e.g.http://freakonometrics.hypotheses.org/2190), but the research paper was on a very different topic. Consider two (i.i.d.) samples and , considered as realizations of random variables and . In all statistical courses, tests on the average are always considered, i.e. Here the observed value was 1,96, i.e. the -value (the area in red above) is exactly 5%. for all , for some vector of probabilities . One can imagine that this multiple test will be more complex. But more interesting, e.g. 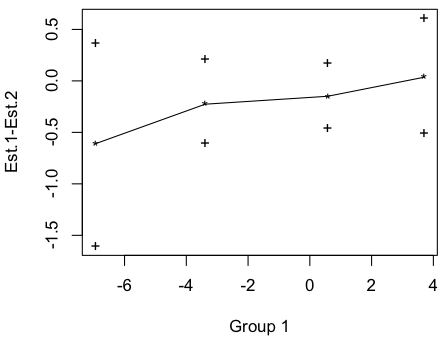 a test on boxplots (are the four quantiles equal ?). Let us start with something a bit more simple: a test on quantiles for one sameple, and the derivation of a confidence interval for quantiles. The important idea here is that it should be extremely simple to get -values. Consider the following sample, and let us run a test to assess if the median can be zero. Because of the use of non-asymptotic distributions, we can not get exactly a 95% confidence interval. But it is not that bad, here. Now, to compare quantiles for two samples… it is more complicated. Exact tests are discussed in Kosorok (1999) (see http://bios.unc.edu/~kosorok/…) or in Li, Tiwari and Wells (1996) (see http://jstor.org/…). For the computational aspects, as mentioned in a post published almost one year ago on http://nicebread.de/…there is a function to compare quantiles for two samples. 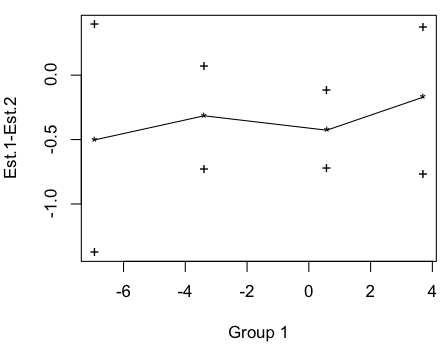 Now, if we want to compare medians from two independent samples, the strategy is rather similar: we bootstrap the two samples – independently – then compute the median, and keep in mind the difference. Then, we will look if the difference is significantly different from 0. E.g. (where the difference is here the oppositive of mine). And when testing for 2 (or more) quantiles, Bonferroni method can be used to take into account that those tests cannot be considered as independent.